The technology press has been replete with stories about Big Data for some time. The use of large volume structured and unstructured data is no longer the Herculean task once the preserve of global enterprises as new agile technologies, supercede traditional database and software techniques. Big Data now offers businesses of all sizes the application of appropriate, accurate and timely data to business operations. Our lives have come to rely on digital for everything from grocery shopping to insurance underwriting. For valuers and property risk managers it brings together information such as potential flood and subsidence risks and offers powerful insights that allow them the ability to optimise operations, capitalise on new sources of revenue and improve productivity. Firms that harness big data will glean more accurate, empirical evidence to support their lending decisions as well as manage any regulatory and capital challenges. The way forward will come with challenges such as privacy, security and liability issues that need to be addressed. As the government has discovered with flood insurance, a more informed approach from insurers can result in unaffordable cover. There will be a fine line to tread between good business and consumer detriment. For now, however, the most pressing concern is the lack of investment in data software and infrastructure and, by lagging behind, businesses could be in danger of exposing themselves to potential and often avoidable hazards – not to mention a loss of competitive advantage. 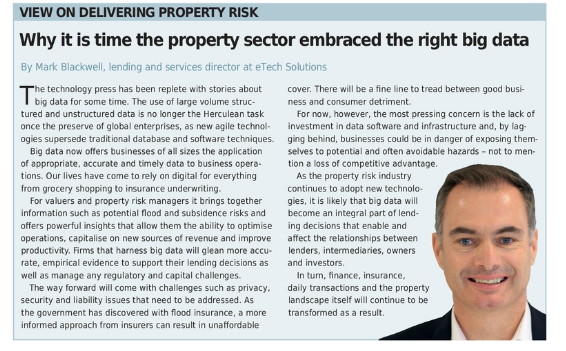 As the property risk industry continues to adopt new technologies, it is likely that big data will become an integral part of lending decisions that enable and affect the relationships between lenders, intermediaries, owners and investors. In turn, finance, insurance, daily transactions and the property landscape itself will continue to be transformed as a result.